Every now and then we have a little party we call Pupapalooza. 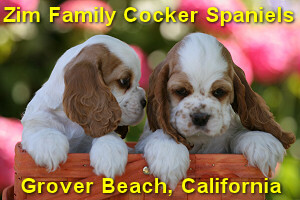 It's a weekend long event that celebrates Cocker Spaniels and their owners. We time these Pupapalooza parties to coincide with our litters of puppies... so that all of our out-of-town friends can come meet our puppies just before the pups go to their new homes. The next Pupapalooza will be held the weekend of September 25, 2010... and will be both a celebration of Joanna's puppies and a reunion of many of our puppies from previous litters. If you don't already know all about our Pupapalooza weekends, and you'd like to see pictures and read all about a typical Pupapalooza to see what it's all about, click here to read about one from a couple of years ago. This is when all of our out-of-town guests will be arriving. Most will be staying at "the official hotel of Pupapalooza"... 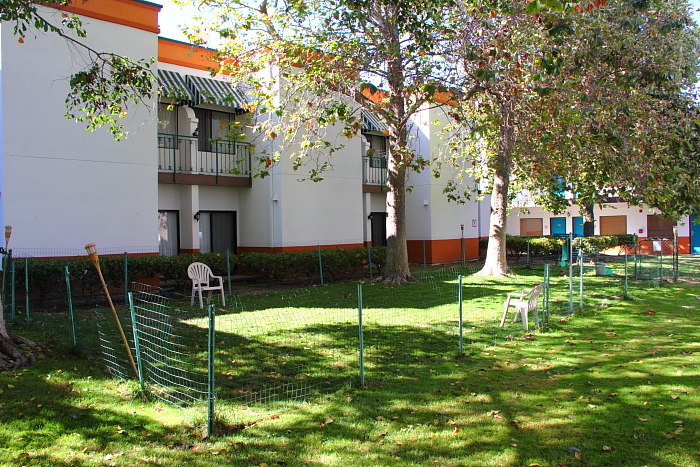 The Oxford Suites, located in the city of Pismo Beach. It is, of course, a dog-friendly hotel... as just about everybody will be bringing their Cocker Spaniel with them. Most people will be checking in to the hotel on Friday afternoon. It's a fun scene with a party atmosphere, as online friends get together for the first time since the last Pupapalooza... and all the dogs check each other out. When you're ready to find all the other Cocker people, just head to the doggie play area right there on the grounds of the Oxford Suites. Try to get settled in by 6 PM, because that's when the first event of the weekend gets started: the pizza party! It's the only meal that we'll all have together during the weekend. We'll have a couple of tables with pizza and soft drinks set up right there by the doggie play area, and you can just put your dog inside the play area for a few minutes and enjoy your meal and the fellowship of all the other Cocker lovers. You might want to bring your own collapsible lawn chair or beach chair. I'll be paying for all the pizza up front... so just slip me a couple of bucks sometime during the evening to cover your share. 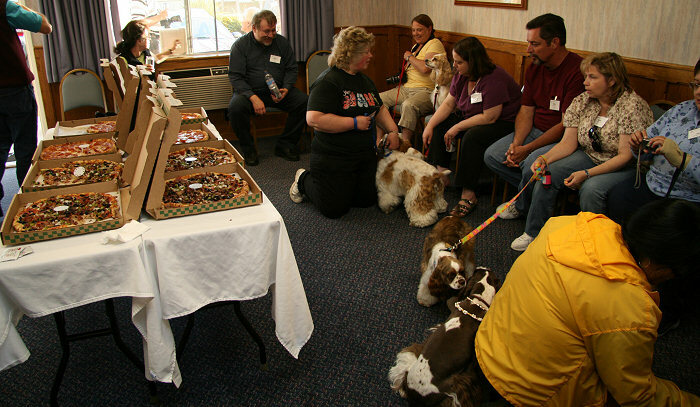 Here's a photo from one of our Pupapalooza pizza parties in past years... when we used to have them indoors. That room was always too small, and it was awkward having the dogs right there with all that food. I think the new arrangement of having it outdoors and right next to that fenced-in pet area will work out perfectly. The pizza party usually breaks up after a couple of hours, and I'll be heading home to take care of the pups... but from what I've heard in past years, there are usually some fun mini-parties in some of the rooms at the hotel. Have fun, but save some energy for Saturday because it's going to be a big day! Get up early, or sleep in late... whatever suits your mood. One great thing about the Oxford Suites is that they serve a complete breakfast which is complimentary for the hotel's guests. And I'm not talking about a continental breakfast, either... it's a real breakfast with eggs made to order, and all that good stuff. Enjoy it! I have had breakfast at the Oxford Suites quite a few times (it was my mom's favorite hotel) and I always enjoyed them. But if for some reason you don't like the idea of a free breakfast, there's also a Denny's restaurant just down the block. In the photo above, you can see the Puppycam on a tripod on the roof... it allowed people who were not able to attend to enjoy the fun, too. 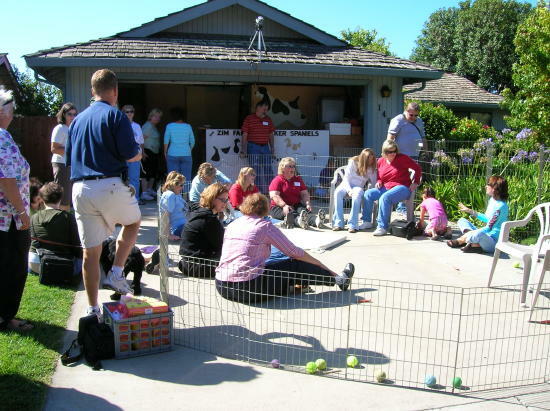 As it was still a little early and there was still some dew on the lawn, we set up a pen on the driveway and then had a "petting zoo" for the puppies and all of their fans. The 10 AM meet-and-greet usually lasts a couple of hours... and after that, you're on your own for lunch. Taco Bell and McDonalds are one block from our house... or go for something better at one of many good restaurants in our area. On Saturday afternoon, starting at 1 PM, it's the main event... at the beach at Port San Luis. This is the most fun part, because everyone can let their dogs off leash. Some like to go in the water, but most don't. In the photo above, you can see Abby and Donna J cooling off in the water. Abby is the mother or grandmother of quite a few of the dogs that will be at Pupapalooza. It's amazing how many people attend Pupapalooza, and how far they come! We've had people fly out from Michigan and one even came all the way from London, England, just for Pupapalooza. Most of the folks are from California, though... and drive from the Los Angeles, San Francisco Bay, or San Joaquin Valley areas. Typically, we have 80-100 people and 40-50 Cockers at a Pupapalooza. Click here to see a very large version of this group photo from 2006. The beach portion of Pupapalooza usually lasts until about 4 PM, and then you have a choice... you can either come back over to our house and play with the pups some more (we'll definitely be on the lawn at that hour of the day) or this is your big opportunity to relax before the evening's activities. Some people like to use this time to head out to a nice restaurant such as McLintocks steakhouse... which has an early-bird menu with more affordable prices at this hour of the day. Other people like to head back to the hotel and have some food there. 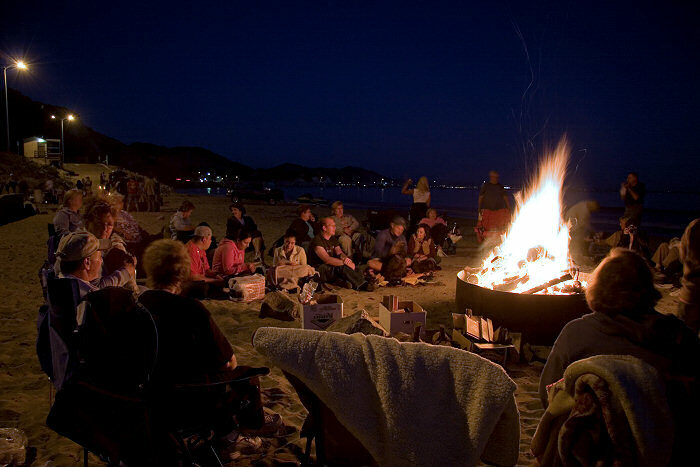 Whatever you do... just be ready for action at 7 PM, when we meet back at the beach for a good old fashioned beach bonfire! The bonfire usually last several hours, or until the tide comes in, whichever happens first!!! After that, we've usually exhausted just about everyone, and we all retire for the night. On Sunday, you're on your own to have whatever kind of fun you'd like to have in our area. I'll be busy at the Zim house, as this is the big day when all the puppies get to go home with their new owners. After the last one leaves, I will crash from an exhausting weekend! But I'm told that back at the hotel, a lot of spontaneous fun happens on Sunday morning before everyone finally checks out of the hotel and heads home. Need to know how to get to Pupapalooza? Here's a map! Take the Avila Beach Drive exit from the freeway. (If you are coming from the north, you can take a little shortcut and take San Luis Bay Drive which will then bring you to a stoplight at Avila Beach Drive, where you make a right turn.) Follow the signs to Port San Luis. When you see dozens of boats moored in the harbor, you're there. (Approximately four miles from the freeway.) Park your car somewhere in the vicinity of the 3 street lights or the pump shed. Look down on the beach, and you should see a bunch of Cocker Spaniels! Walk down the stairs and join the fun! 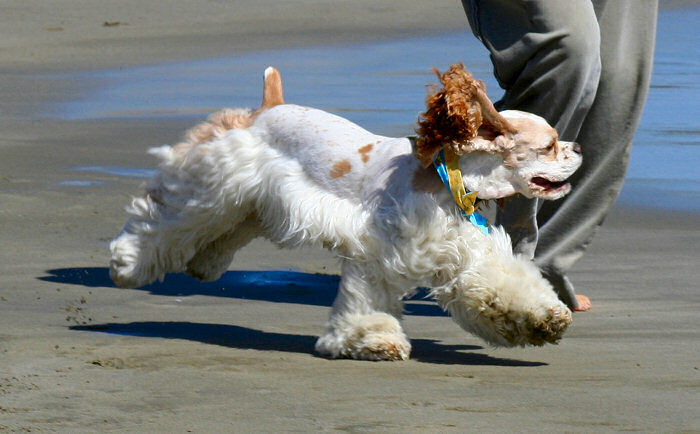 Pupapalooza is open to anyone that loves Cocker Spaniels! You do not have to own a Zim dog, or even own a Cocker at all. You can bring your Cocker, even it is not a Zim dog. We do ask that you leave your non-Cockers at home! 1. Don't bring more dogs than you can handle. If you own three Cockers, and you're coming to Pupapalooza alone, you probably need to leave one or two of your dogs at home. We're all going to have our hands full taking care of our own dogs, so you need to be able to handle yours on your own. 2. Bring friendly, social dogs... leave the ones with behavior problems at home! If your dog can get along with the other dogs at your local dog park, he or she will do fine at Pupapalooza. If your dog has trouble getting along with other dogs, you should come to Pupapalooza without your dog. 3. Make sure your dog is up-to-date on vaccinations. Don't bring young puppies that haven't finished their entire series of vaccinations, including rabies. 4. Please don't bring un-neutered male dogs, or female dogs that are in heat. 5. Bring a crate, just in case your dog has trouble getting along and needs to be confined. At the beach, you can leave the crate in your car... just so you have it and can get it if you need it. 6. At the beach, please follow the local regulations... which include: no alcohol on the beach, and no glass bottles of any kind. 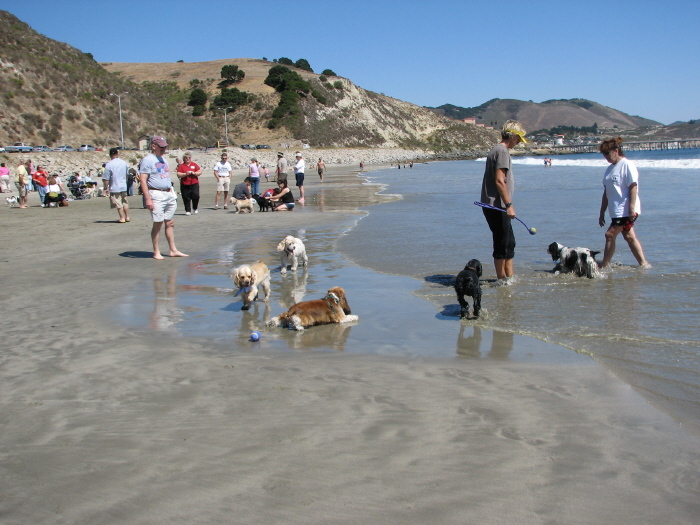 Do not bury dog poop in the sand... scoop it up and carry it to the nearest trash can. For all the latest news about the upcoming Pupapalooza, including the chance to find out who will be there and to ask them questions... please visit our forum. Pupapalooza began as a reunion of our past puppies... but you don't have to own a Zim family puppy to be able to attend. We'd love to have you join us. Feel free to bring your dog, but only if it's a Cocker! It would be a very good idea to bring a beach chair with you, too. Have a question about Pupapalooza? Copyright ©2010 Jim Zimmerlin, Grover Beach, California. All rights reserved.